The Lockheed Hudson was designed by Kelly Johnson for the Royal Air Force in the late 1930's, it was the biggest order Lockheed had ever procured to date, the requirement was for a coastal reconnaissance and light bomber. The Hudson first flew in late 1938, and entered RAF service in 1939, just in time for WW2. The Lockheed Hudson served extensively throughout the second world war with RAF Coastal Command and the RCAF's anti-submarine squadrons. The original RAF order had been for 200 aircraft but massive orders during the war from five different allied air forces resulted in a total of just under 3000 aircraft having been produced at the end of production in 1943, many having been supplied under the 1941 "Lease Lend" program. 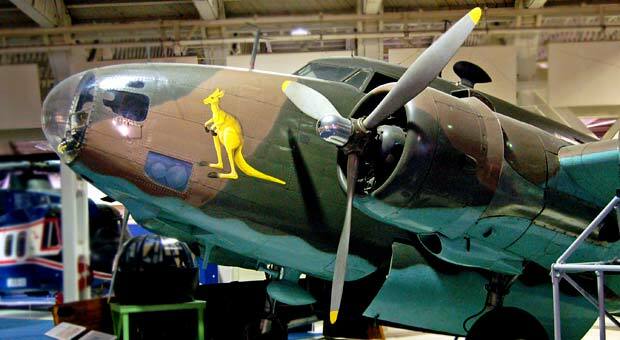 This picture of Lockheed Hudson is Copyright © June 2014 Siteseen Ltd. We only authorise non-commercial picture use and particularly encourage their use for educational purposes. This Lockheed Hudson picture is not in the Public Domain. 3) Use of this Lockheed Hudson picture, or any of our pictures on websites re-distributing copyright free material is strictly prohibited.